Canada’s two largest airlines believe that capacity growth in the country’s domestic market is in line with demand even if the expansion is occurring at a much more rapid pace than the country’s GDP growth. Both Air Canada and WestJet are solidly expanding their domestic supply during CY2014 at rates higher than their US counterparts. But the airlines conclude the dynamics of the Canadian market place are different from the US, where a once fragmented industry has rationalised due to consolidation. Part of each airline’s rationale for expanding capacity is an ability to stimulate traffic through lower fares – a strategy WestJet has adopted since its inception. But with its decreasing costs allowing it to target a higher volume of leisure customers, Air Canada also believes it is stimulating some traffic it was previously unable to access. As 3Q2014 came to a close, Air Canada and WestJet both concluded that the capacity increases in Canada’s domestic market were rational, even if the projected growth by each airline for CY2014 exceeds Canada’s estimated GDP growth of 2.3%. WestJet plans 5% to 6% capacity growth in CY2015. At the end of 2Q2014, WestJet revised it system capacity growth upwards to a range of 6% to 7% (versus previous targets of 5% to 6% growth), citing strong demand across most of its system. In mid-Sep-2014 WestJet concluded that US airlines have comparatively kept domestic capacity tight, and while its projected 5% to 6% capacity growth is significant, demand in the Canadian aviation industry remains strong. WestJet’s system-wide traffic for the 8M ending Aug-2014 increased 6.3% on 6.5% ASM growth, which kept loads essentially flat year-on-year at a healthy 83%. Air Canada’s domestic traffic for that same time period increased 4.6% on a 4% ASM increase, which also kept its load factors flat at 83%. Data from CAPA and OAG show that for the week of 29-Sep-2014 that seats deployed in the Canadian domestic market place have risen 5% year-on-year. 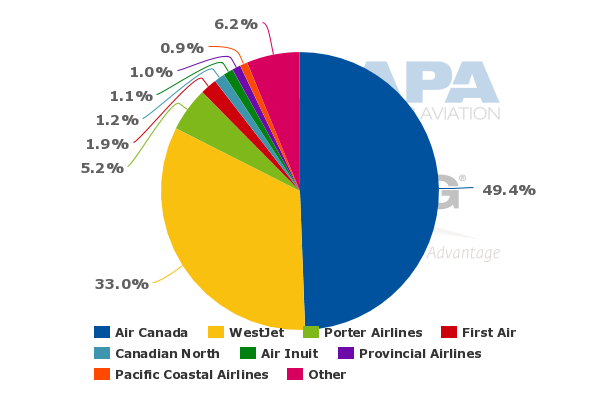 WestJet, which represents roughly 33% of the domestic seats on offer has increased its seat count by 9%. Air Canada’s seats on offer have grown 5.6% year-on-year. It holds a 49% seat share in the market. For the week of 29-Sep-2015 to 5-Oct-2015, 49% of Canada's seats were deployed into the domestic market and 51% were operated to international markets. For roughly two decades, two large airlines have dominated the Canadian domestic market. Given those dynamics it may seem reasonable that capacity growth is higher than the US market, and both Air Canada and WestJet believe the supply increases are being amply absorbed. Air Canada recently concluded that with six large airlines in the US market place consolidating into three – American, Delta and United – capacity discipline has ensued. American is projecting system capacity growth of 2.5% in CY2014, Delta is targeting flat to 2% growth and United is projecting keeping capacity flat to 1% growth. WestJet recently reiterated its 4.8% unit revenue growth in 2Q2014 and 4.5% rise in yields, declaring that at that time it concluded it would continue to record unit revenue growth. “We haven’t seen any moderation to that guidance,” stated airline CFO Vito Culmone in mid-Sep-2014. He stressed that pricing in the market place remained fairly strong. The airline’s regional subsidiary Encore, which celebrated its one year anniversary in Jun-2014, is now operating 14 Bombardier Q400s, and has committed to operate 30 of the 78-seat turboprops. Encore operates service in roughly 23 Canadian domestic markets, and recently announced new twice-daily service from Toronto Pearson to Fredericton in Apr-2015, joining Air Canada in operating on the pairing. After focusing on serving Western Canada in its initial launch period, Encore migrated eastward beginning in Jun-2014 with the launch of Toronto to Thunder Bay and Thunder Bay to Winnipeg. Other routes from Toronto include Ottawa and Montreal. WestJet has consistently stated that for every two guests travelling on Encore, one passenger connects onto mainline service. Mr Culmone remarked that if WestJet is able to keep that 50% connecting passenger baseline as it grows to 30 aircraft, Encore’s performance will have exceeded the company’s expectations. Offering some of Air Canada’s most candid comments about the increased competition from Encore, airline Mr Rousseau remarked that Air Canada had expected WestJet’s regional market place expansion. He explained initially Air Canada placed Q400s on routes “we thought they would fly into”. During late 2012 and early 2013 prior to Encore’s launch, Air Canada deployed Q400s on several routes from Calgary and three routes from Edmonton, replacing 50-seat jet previously operated in the markets. Although Mr Rousseau declared Encore “nonmaterial” to Air Canada, he did stress one way that the airline was dealing with WestJet’s regional expansion was to work with its major regional partner Jazz to lower its cost structure. 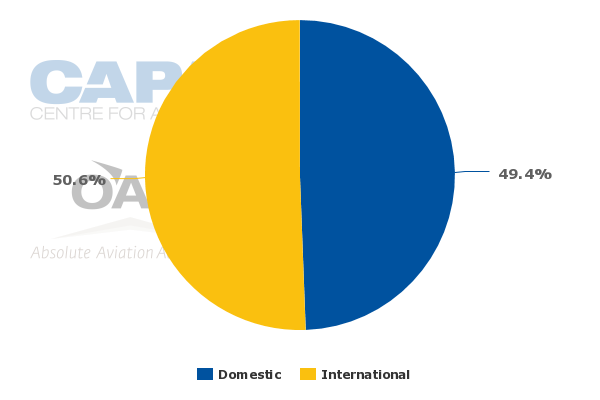 During the last year and a half, said Mr Rousseau, Air Canada has typically awarded regional lift to other airlines including Sky Regional and Air Georgia whose cost structures are more competitive with Encore than Jazz. Air Canada appears to share WestJet’s view that demand in Canada is holding steady. But its conclusions are drawn from its ability to stimulate demand with its lower cost leisure subsidiary rouge, which also has now been in operation for more than a year. With rouge, Air Canada now has the cost structure to offer fares to attract a new segment of customers that were previously not viable with its mainline cost profile. Air Canada is also working to leverage sixth freedom traffic primarily through its hub at Toronto Pearson, and during 3Q2014 its traffic flows from the US over Toronto to long-haul international markets increased 32%. Its strategy is to attract passengers from secondary US markets such as Boston and Pittsburgh, and it has worked to create a hassle free transfer process through Pearson as Mr Rousseau explained bags are checked to the final destination and transfer passenger remain within the same terminal at Pearson. Mr Rousseau noted that Air Canada had negotiated lower fees with Pearson, noting the airline was bringing traffic to Pearson through its sixth freedom flights. Boiling the arrangement down to its simplest terms, Air Canada’s CFO remarked that the airline’s cost on new capacity added to Pearson is lower than existing capacity. Air Canada does acknowledge that its higher mix of leisure passengers and sixth freedom travellers have “lowered yields attached to them”, said Mr Rousseau. But he also stressed that in order to target that growth Air Canada “had to put in planes that cost less money”. During 1H2014 Air Canada’s yields were essentially flat, but its unit cost excluding fuel dropped 3.6% as the airline works to decrease its cost in that metric by 15% (from CY2012 levels) in the medium term. With the Canadian market holding steady, Air Canada can continue to maintain that balance in the short term, but over the long term it is going to have to find ways to shore up revenue. It recently matched WestJet’s domestic first bag fee, which could fetch up to CAD50 million (USD44 million) to CAD75 million (USD67 million) in annual revenue, according to the Globe and Mail. Air Canada also projects CAD100 million (USD89 million) in annual benefit from a new revenue management system implemented during 1H2015. Air Canada is no doubt looking at other revenue opportunities as its passenger mix continues to change during the next few years. For now Air Canada and WestJet appear to be leveraging the relatively strong Canadian economic environment, and their respective capacity increases do not seem to be creating a scenario of supply outstripping demand. But even in Canada's relatively stable duopoly there is always the risk of miscalculating demand scenarios, and once capacity is unleashed it can be tough and costly to reign in. One element within the Canadian market remains certain – its two largest airlines are working aggressively to broaden their passenger bases and intend to continue to compete fiercely to maintain their current status in the market - just as a new crop of ULCCs are circling and attempting to take flight. See related report: Jet Naked. Another ULCC for Canada – how will Air Canada and WestJet respond?